Artists often use a section of reality to make an interesting design. Look a atoms or snowflakes, or the center of a flower. This lesson has two parts, in the first, students will draw a contour drawing of an insect. 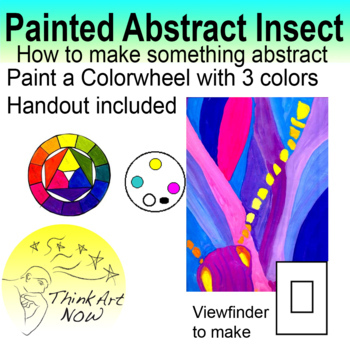 In the second part, the students will use the insect and a view finder to search for an abstract design for their painting. After the painting is sketched, students will paint a color wheel, as follows or print the PDF file. They will mix colors and then paint their design.